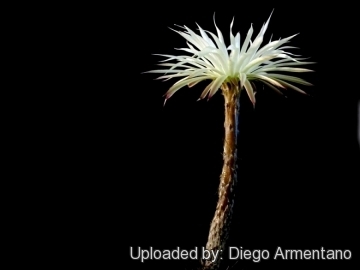 This tiny plant seems much underrated in cultivation, perhaps because it so easy to grow, notwithstanding this, it is one of the most fascinating and showy species! Origin and Habitat: Eastern Argentina ( Santiago del Estero, Santa Fe, San Juan, San Luis, Mendoza, La Rioja, Mendoza, Colonia Ceres). Echinopsis mirabilis has a relatively wide range, is known from at least four disjunct areas, the species is not particularly abundant but is common. Altitude: 0 - 1000 metres above sea level. Habitat: The species grows on the edges of salinas and in monte shrublands, often under shrubs in flat prairies up to the base of mountains. There are no known major threats for this species. 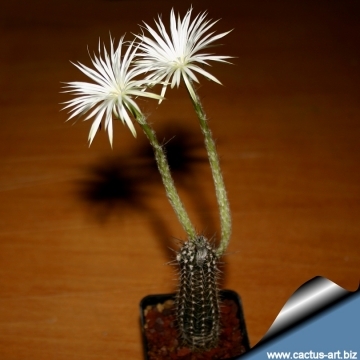 Description: Setiechinopsis mirabilis is a very small cactus (usually) solitary. The plants are easily grown from seed and providing good cultural conditions they may begin to flower in their second year. 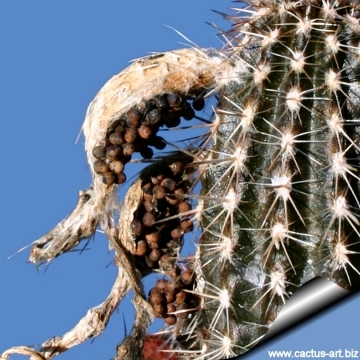 Stem: Dark brown, cylindrical which seldom grows taller than 15 cm, 2.5 cm in diameter. The plants seem to die long before this, and are best replaced with fresh seed-raised ones. 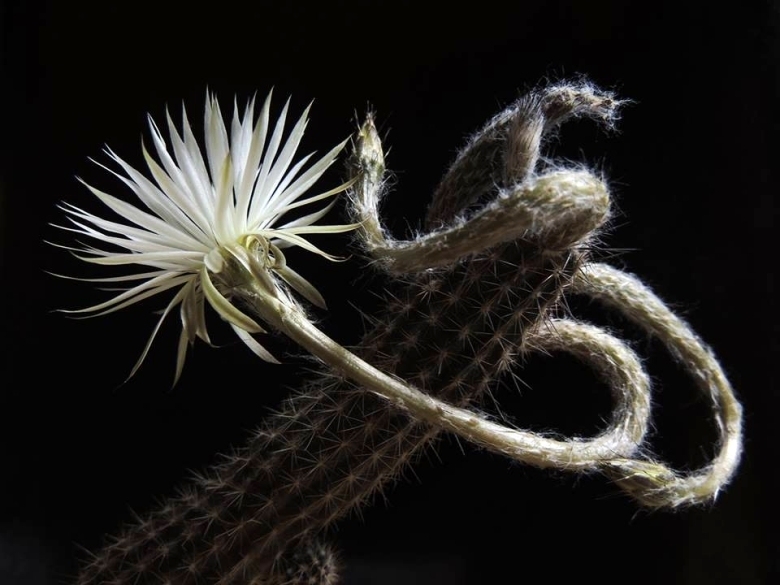 Flowers: Last for only one night, but a number are produced in succession. Blooming season: Summer, the blooms open at sun set and last only a few hours. The spicy exotic perfume and long, narrow flower tube suggest that the natural pollinator must be a long-tongued moth. 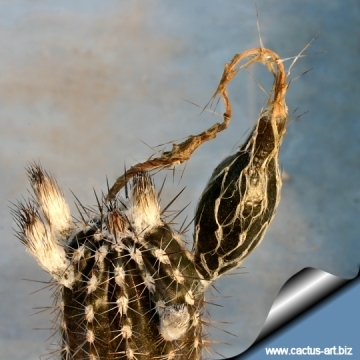 Fruit: Drying at maturity an opening laterally by a longitudinal fissures, with numerous seed. 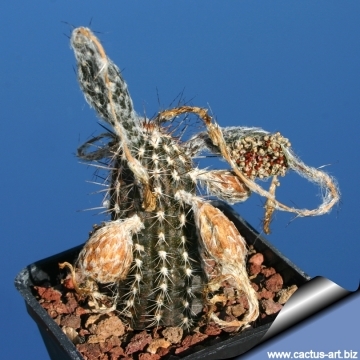 Notes: (Setiechinopsis) It is a short-lived cactus that is more related to the Cereus group of plants than to Echinopsis which its name appears to relate it to. 1) Demaio, P., Perea, M. & Trevisson, M. 2013. 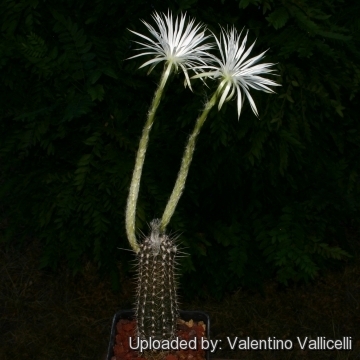 Echinopsis mirabilis. The IUCN Red List of Threatened Species. Version 2014.3. <www.iucnredlist.org>. Downloaded on 23 May 2015. 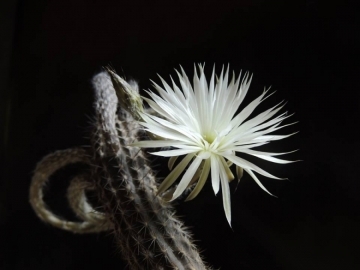 Cultivation and Propagation: This cactus is cultivated for its flowers and is among the easiest species to grow, flower and propagate. Indicated for full sun or half shade exposure, water regularly from march to October, rot prone in winter, needs good drainage, It needs to be kept in a cool place during winter rest (can briefly tolerate temp. as low as -4°C) Stems may possibly become purple and limp in winter but revitalize in early spring. Occasionally the plants reach some 15cm tall, but this seems rare. 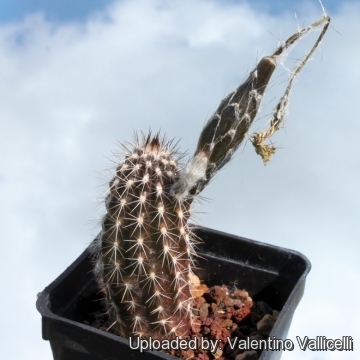 The plants seem to die long before this, and are best replaced with fresh seed-raised ones. Propagation:: They grow trivially easily from their freely produced seed and will bloom their second year. It is self-fertile, hundreds of seeds are produced in every dry fruit whether it has been pollinated or not.